The study featured data from Associate Professor Michael Noad of the UQ School of Veterinary Science's Cetacean Ecology and Acoustics Laboratory (CEAL). "All the males in a population sing the same complex song, but the pattern of song changes with time, sometimes quite rapidly, across the population," Dr Noad said. "Learning new songs is a form of what's known as 'social learning', which is where individual animals learn behaviours from each other rather than having them passed on from one generation to another genetically. "Although we know that whales change their songs over time, we don't know about how they learn the new songs. "The rate of change though shows that they are constantly learning and updating their songs rapidly." 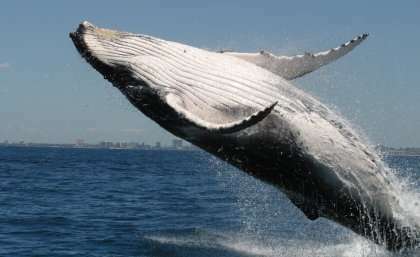 The study was led by UQ graduate Dr Ellen Garland, now a postdoctoral fellow at the University of St Andrews, Scotland, and focused on whale songs that were in the process of changing from one type to another. "We recorded many individual singers from several populations, including the eastern Australian population and other populations in the South Pacific," Dr Noad said. "We looked for songs that were caught in the act of changing; songs that had some of the old song as well as some of the new song. "Ellen found a couple of interesting things. When we found these rare 'hybrid' songs, the themes of the songs, either old or new, were intact, showing that the whales probably learn songs theme-by-theme like the verse of a human song. "The other interesting thing was when they switched mid-song from old to new or new to old, it was during a theme most similar to another theme in either old or new songs. "These themes may have been used as a way of bridging the old and new songs and therefore help with social learning. "This provides some evidence for how animals rapidly learn large, complex displays and may have relevance for understanding how human language, the most outstanding example of social learning, evolved." The study, Cultural transmission in humpback whales: insights from song hybridization events during revolutionary song change, is published in the Proceedings of the National Academy of Sciences (PNAS) journal.